출발: 서울, 2011년 10월 1일 06:00 / Start: Seoul, October 1, 06:00 a.m.
한순권은 SBS를 위한 저지를 디자인하였습니다. 저지에 대해 관심을 가져주신다면, 이번 SBS를 위한 저지 (반팔, 긴팔) 제작이 가능합니다. ACP 에서 승인한 이 1000k 브레베는 서울에서 부산을 왕복하는 것입니다 (overview maps). 라이더들은 새벽에 유명한 한강 자전거도로에서 출발하게 됩니다. 3일후 돌아오는 길에 지친 라이더들은 40km 동안 교통체증 없는 이 길에 감사하게 될 것입니다. 우리는 다음에 장엄한 강의 아름다운 전망을 즐기고, 다른 120km동안 한강과 함께합니다. 경로는 충주시내까지 160km 동안 대부분 조용한 시골 도로를 따라 평평한 지형을 부드럽게 지나갈 것입니다. 충주 후 도로의 경관은 하천과 농경지가 점차적으로 숲과 산들로 서서히 변해갈것입니다. 문경 (220km) 근처에서 한반도를 가르는 오르막을 점차 오르게 됩니다. 그래도 터널을 통해 지나는 것이라 심하지는 않습니다. 문경을 지나 루트는 아름다운 계곡과 강을 따라 한국의 녹색 심장으로 들어갑니다. 여기, 매력적인 풍경이 랜도너들을 기다리고 있고, 쾌적한 마을로 주로 농업 지역인 상주와 예천을 통과하여 이동합니다. 이 곳은 1000km을 완주하기 위해 몇 킬로를 추가로 우회하기에 완벽한 곳입니다. 국내 최대 규모의 강, 낙동강 강 건넌 후, 아주 조용하고 쾌적한 도로는 농지와 숲을 통해 연결됩니다. 이 매력적인 (그리고 매우 쉬운 라이딩) 녹색 심장이 400km 지점의 금호 컨트롤을 넘어 계속됩니다. 다음 50km는 거친 언덕으로 좀 힘들고 도전적일 것입니다. 아침 태양이 동쪽 지평선에서 떠오르면 한국에서 가장 아름다운 산맥 중 하나인 가지산에서 멋진 경관을 감상하는 것으로 수고를 보상받을 것입니다. 450km지점에서 표고 515m의 가장 높은 지점을 통과 후, 라이더들은 온양의 컨트롤까지​​ 짜릿한 다운힐을 할 수 있습니다. 앞으로 인구 밀도가 높은 지역임에도 불구하고, 경로는 양산시의 마을까지 주로 조용하고 평면 시골 도로를 따라 갑니다. 한 번 더 고개를 넘어 라이더들은 부산으로 진입하여 한국에서 가장 유명한 해변, 해운대로 향해 갑니다. This ACP-approved 1000 km Brevet is an out-and-back from Seoul to Busan. Riders will start at daybreak on the famous Seoul Han River bike trail, which will provide 40 kilometers of traffic-free and traffic light-free riding, which tired riders will appreciate returning three days later. We will then accompany the Han River for another 120 km, enjoying beautiful views of this majestic river. 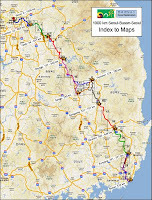 The route will follow mostly quiet rural roads and fairly smooth flat terrain until the city of Chungju at km 160. After Chungju the scenery of rivers and farmland gradually changes into views on forested mountains and the road gradually climbs towards the continental divide of the Korean peninsula near Mungyeong (km 220). Still, there is not much climbing, as the mountain range will be crossed through a tunnel. After Mungyeong the route follows the beautiful valley of the Yeong River and into the green heart of Korea. Here, an attractive ondulating scenery awaits the Randonneur, moving through a mainly agricultural region with pleasant towns such as Sangju and Yecheon. It is the perfect area to allow for detours to add extra kilometers in order to make the 1000 km complete. After crossing Korea's largest river, the Nakdong River, a very quiet and pleasant road leads through forested area, alternated with farmland. This attractive (and fairly easy riding) green heart of the country will continue beyond the control of Geumho, at 400 kms. For the next 50 km hills will challenge riders with some tough climbs. With the morning sun climbing on the eastern horizon, the efforts will be rewarded with spectacular views on one of Korea's most beautiful mountain ranges, the Gaji-san. After passing the highest point at 515 m above sea level at 450 km, riders are in for an exhilarating descent to the control in Eonyang. Even with a densely populated area ahead, the route follows mainly quiet and flat country roads until the town of Yangsan. One more hill and riders will enter the city of Busan and work their way to Korea's most famous beach: HAEUNDAE. While enjoying the ocean surf with the many Sunday afternoon bathers, about 520 kilometers have been achieved. The route back to Seoul follows mainly the same roads, and stretches riders have enjoyed during daylight can now be cherished under the stars. The final 40 km will take riders along the Han River bike trail to the finish.